Around September 11th, clouds and heavy rain had started to roll in along Colorado Front Range, a 130 mile long area along the eastern slope of the Rockies stretching from Fort Collins south past Denver & Colorado Springs. In a three day period, 9-1/2 inches of rain fell on Boulder, a city that usually receives just 1-1/2 inches for the entire month of September. The resulting runoff, caused raging floods that affected a 4,500 square-mile area, an area bigger than the state of Connecticut. Thousands of people have been left homeless and at least 10 dead. After the flood waters had receeded a bit and officials gave the go ahead for relief workers to enter the area. Operation BBQ Relief volunteers from the surrounding area established a command center in the town of Longmont CO.
OBR volunteer Scott Nix, of Rubbin’ Buttz BBQ was one of the first on the scene along with members of the Rocky Mountain BBQ Association. 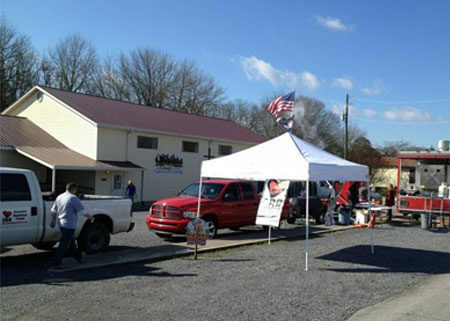 Once the smokers were setup and food started cooking, OBR volunteers were able to put out about 1,850 hot meals to people who had not had a hot meal in several days. On Sunday the group provided approximately 2,100 meals for a group of people that had just come down from the mountainous areas. At the conclusion of the six day deployment, OBR volunteers cooked 11,150 hot meals and left additional food behind for local groups to cook throughout the week. On May 20, 2013, an EF-5 tornado struck Moore, OK, a suburb of Oklahoma City. The tornado was part of a massive weather system that had produced thunderstorms and smaller tornadoes over previous days. The tornado touched down just before 3:00 p.m. CDT, crossing through a heavily populated area of Moore over a 17-mile path for 39 minutes. The tornado followed a similar track to the Bridge Creek-Moore tornado that struck the area in 1999. The tornado touched down at an EF-0 intensity west of Newcastle and rapidly intensified to an EF-4 within ten minutes. As it headed toward Moore through more rural areas, the intensity level lessened to an EF-2 strength before it reintensified to an EF-5 strength before hitting Moore. Buildings were completely destroyed, and the Oklahoma Department of Emergency Management reported 1150 homes destroyed and $2 billion in damages. Both Oklahoma Governor Mary Fallin and President Barack Obama declared a state of emergency, and federal aid was dispatched to the area. Operation BBQ Relief deployed on May 21, arriving in Moore in the afternoon and served 12,000 meals on that first day. Throughout the 12-day deployment, volunteers served 143,000 meals, the largest operation to date. With another small tornado passing through the area on May 31, the volunteers took shelter but still put out meals when they were given the all-clear. The outpouring of support from volunteers was tremendous. Prior to the main team’s arrival in Moore, OBR volunteer Jeff Hughes and supporters got 5000 lunches out to police, fire and EMS workers. Our website received over one million hits on the first day from supporters wanting to help out. On Saturday, May 25, OBR put out 26,000 meals. Had Saturday been an operation on its own, it would have been our fourth largest operation since our founding two years ago. 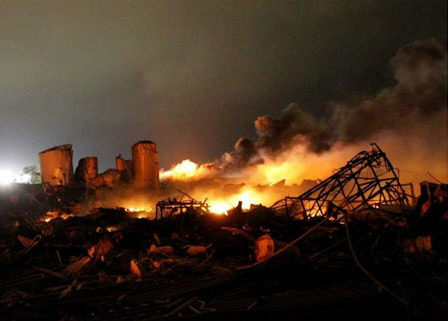 A massive explosion and fire at a fertilizer plant in the small town of West, Texas, which badly damaged a five-block area.The blast was so massive and deafening, its ground motion registered as an earthquake. So far 12 deaths have been confirmed with another 60 people unaccounted for. When OBR volunteers arrived in the late afternoon in West, they quickly found out that the Red Cross & Salvation Army were not cooking any hot meals. Knowing what a simple hot meal can provide for someone who hasn’t had one in a while, they quickly setup smokers and got food going. Later that evening, they were able to serve 500 hot meals. During the deployment, OBR was approached and asked to cater two memorial services for fallen firefighters. One of which was from a Dallas engine company but had lived in the town of West. The entire engine company from Dallas came up for the memorial, a very humbling experience. At the conclusion of the four-day operation, OBR volunteers had served 4,765 hot meals to grateful residents and first responders and left behind plenty of food for the VFW to continue feeding people. Little did we know that all the other organizations inexplicably decided to pull out that evening, leaving the town and first responders in quite a predicament. Not knowing what to do, they reached out to OBR and asked if we could return. Our great volunteers in Texas turned around and were back in the town of West the following day, staying on-site and cooking for an additional four days. During the eight days that OBR volunteers were in West, they cooked over 16,000 meals, providing food to victims, emergency personnel and countless volunteers helping the community. After learning that volunteers who were supposed to provide breakfast to students housed in hotels with their families did not show up, OBR volunteers provided breakfast to 75 students at their school so they would not go hungry. Our most proud moment was delivering food to the homes of the fallen firefighters for their private memorial services. BBQ is known as comfort food, and we would like to think we brought a little comfort to the families in their time of need. Hurricane Sandy was the deadliest and most destructive tropical cyclone of the 2012 Atlantic hurricane season, as well as the second-costliest hurricane in United States history. While it was a Category 2 storm off the coast of the Northeastern United States, the storm became the largest Atlantic hurricane on record (as measured by diameter, with winds spanning 1100 miles). Preliminary estimates assess damage at nearly $75 billion, a total surpassed only by Hurricane Katrina. At least 285 people were killed along the path of the storm in seven countries. The severe and widespread damage the storm caused in the United States, as well as its unusual merge with a frontal system, resulted in the nicknaming of the hurricane by the media and several organizations of the U.S. government “Superstorm Sandy”. Hurricane Sandy slammed into the US Northeast Coast on October 29th. Knowing this would be a very large disaster, OBR began shipping supplies to New Jersey ahead of time. The Shedd BBQ & Blues joint even packed up a truck full of supplies and sent it on its way all the way from Mississippi. Once it was safe to do so, on November 3rd, using experience gained in the triple deployment in IL, IN & KS, OBR teams from the surrounding states setup operations in Hoboken & Neptune, NJ, as well as a third site in Manhattan, NY. At the end of day 1, OBR volunteers had already served 5000 hot meals to displaced residents and first responders. Meal totals quckly shot up in the coming days: 9500 on day two, 8000 on day four, and 9000 on day five. But things soon took a turn for the worse. Just five days laters, a Nor’Easter hit, bringing with it cold, sleet and snow. While the FEMA location in Brick, NJ put up a sign that they were closed because of the weather, OBR volunteers kept putting out hot meals. Day 5 in New York saw the return of Hogzilla and Cousin Ed from Taylor Farms Smokehouse in Tenessee. At the height of operations, OBR teams were cooking in nine seperate locations in New York & New Jersey, teaming up with other organizations such as Mercy Chef’s and The BBQ Brethren. Once operations wound down to a close 12 days later, OBR volunteers had cooked an incredible 100,200 hot meals for first responders and residents, making Operation Sandy the second largest deplyment behind Joplin. During this time, OBR had received generous donations from 40 states and two countries. Via Reuters: Hurricane Isaac has caused up to $1 billion in economic losses for offshore energy properties and up to $1.5 billion in insured losses onshore in Louisiana and neighboring states, disaster modeler Eqecat said on Wednesday. Within days, OBR volunteers from neighboring states were on the scene setting up in St. Bernard Parish and teaming up with Operation Blessing International. Several days later, a second location was opened in Louisiana as well as a location in Mississippi. After 11 days, 49,000 meals were served in Louisiana, and an additional 6000 meals were served in six days in Mississippi for a total of 55,000. The Shed BBQ and Blues Joint, CitiIMPACT Ministries (IMPACT Ministries), Operation Blessing International, Illinois BBQ Alliance, Head Country, 17th Street Bar & Grill. Several strong to mostly weak tornadoes touched down near Dallas and Fort Worth and points east. This included an EF-3 in Forney, Texas, which devastated the Diamond Creek subdivision and a school in town. It was estimated on April 5 that over 1100 homes were damaged in the outbreak, including at least 349 that were destroyed. Remarkably, despite hitting heavily populated areas, no one was killed and very few people were injured. OBR volunteers setup at Bootleg BBQ in Royse City. Larry Newberry shut down his operation and turned it into a relief command post, forsaking any business of his own for the week. His location is the first spot in Texas where Operation BBQ Relief has set up, and as such, we left the OBR banner hanging inside his business for all customers coming in to see. During the three day relief operation, OBR volunteers served just over 2500 meals to tornado victims and first responders. This operation marked the 8th state in which OBR volunteers have cooked meals. It also put the total number of hot meals served by OBR since its inception in Joplin, MO, in May 2011 at over 150,000 meals. Disaster: As many as 17 tornadoes across multiple states Classification: EF-2 Harveyville, KS; EF-4 Harrisburg, IL; EF-4 Marysville, IN Casualties: Harveyville, KS: Eight or nine people injured, 40%-60% of the town destroyed Harrisburg, IL: Six people dead and 100 injured, 250-300 buildings damaged or destroyed Marysville, IN Area: 14 dead, hundreds injured. Nearly every home in Marysville was either destroyed or damaged. Nearby Henryville, IN, suffered significant damage as well. On the evening of February 29th, numerous tornadoes ripped across the Midwest causing widespread damage. Suspected tornadoes killed 14, as the powerful storms ripped through the Midwest, obliterating homes, churches and businesses across six states. Within thirty six hours of tornados touching down, OBR volunteers from the Kansas City area were in downstate Harrisburg, IL. Joining up with a team from the 17th Street Bar & Grill, a local BBQ restaurant in nearby Murphysboro, IL, they once again began cooking hot meals for displaced residents and first responders. The National Weather Service reported that on Friday night, March 2nd, two tornadoes, one an EF-4 packing 175 mph winds, hit Henryville, IN an area north of Louisville, KY. The first was on the ground for 52 miles and measured about 150 yards wide. A second, smaller tornado passed through the town a short while later. Taylor Farms Smokehouse in Tennessee, which had previously worked with OBR in Joplin, responded on Saturday to Marysville, IN which was almost obliterated by tornados the previous night. Monitoring the situation in Harveyville, KS, OBR teams responded on Saturday, after officials allowed non-residents into the town. This was the first time that OBR had provided disaster relief in three states simultaneously. Apprised of the extent of the damages to the surrounding communities, the team from Harrisburg finished up and continued on to Marysville to provide additional assistance. When Operation BBQ Relief finally ended operations after 9 long days and nights, OBR volunteers had traveled 1500 miles and cooked over 1800 meals in Harveyville, KS; 5200 meals in Harrisburg, IL; and 7500 meals in Marysville, IN.